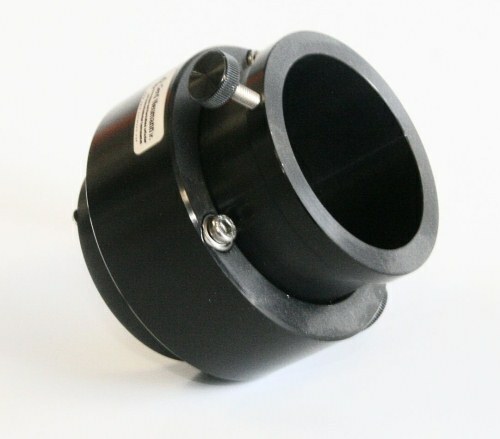 The Heli-FOK is a 2" Helical-Crayford focusser with a very short design, ideal suited for fast telescopes or if you are aiming for a secondary mirror with minimal diameter. Since it´s introduction at the ATT fair of 2000 the Heli-FOK is used by lot´s of customers with great enthusiasm. The Heli-FOK is a high-quality and low-priced 2" focusser. It´s the ideal choice for any large Dobsonian or as a replacment for those focussers of minor quality often found on commercial telescopes today. The drawtube is pressed by two set screws with teflon base on four ball bearings. Additional, you may clamp the drawtube in each Positon with a third screw securely. The focusser can handle large loads, such as (DSLR-)cameras, CCD cameras or heavy 2 "eyepieces. However, the Heli-FOK is not perfectly suited for the use of cameras, CCD cameras or Binocular-viewers, as they would have to be rotated for focusing. The outer body has a diameterof 80mm. (Martin Neuer) "... I have two of Gerd's Heli-Fok focussers in use and they can be highly recommend. (...) The Heli-Fok are solid, clearly adjustable, and really good. Compared to other focussers they´re quite inexpensive ... "